Doctor Who: The Moffat Scripts – THE ZYGON INVERSION | Warped Factor - Words in the Key of Geek. 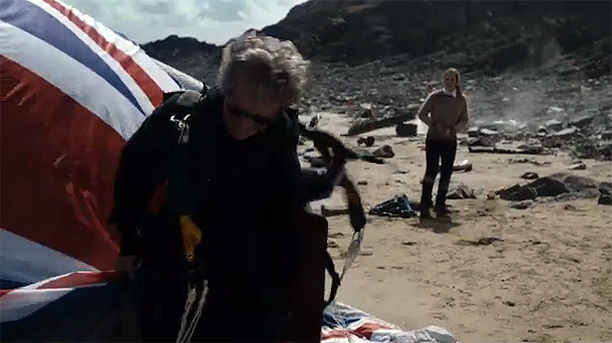 A little cheeky reference to The Spy Who Loved Me there, just like the opening to this episode when the Doctor opens up his Union Jack parachute. No, I’m not apologising for my bad singing voice. 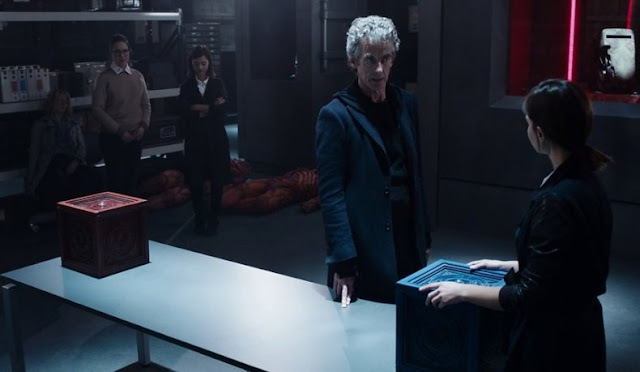 Picking up where Peter Harness’s The Zygon Invasion left off, The Zygon Inversion sees Steven Moffat join him with a co-writer credit forcing me to break my unwritten rule and review only half a story (don’t worry, I’m sure I’ll cope). Jenna Coleman is the star of the show for the first half with her dual role as both Clara and Bonnie. She is utterly sublime in both parts, giving Bonnie a more sleek, posh and borderline-camp portrayal to distinguish her from Clara. It really hammers home what we we're about to lose when she goes on her way a few episodes later; thankfully she got her performance in this story to leave an impression. 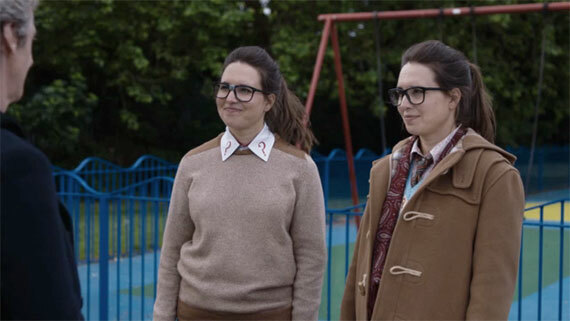 Ingrid Oliver is also amazing in this story as Osgood who may or may not be a Zygon. Osgood is the peacekeeper and Oliver plays her in the right cool-mannered way to present the character as more than the irritating-fandom-personified that some seem to think she is. She’s got the makings of a companion to the Doctor in her and when she declines to join him “Totally And Radically Driving In Space” you do feel robbed. On the plus side we know that she’ll always be waiting on Earth, ready to keep putting in stellar performance after stellar performance and putting a smile on the collective fandom’s face. By the end there are two of her and that’s a good thing. All of them – Clara, Kate, Osgood, Bonnie – serve as great examples of female characters written well. The days of screaming girls asking the Doctor to explain what doorkeys do* are long behind us! But then there’s Peter Capaldi. If you couldn’t tell from my look at The Magician’s Apprentice/The Witch’s Familiar I cannot get over the fact he was overlooked for a BAFTA nomination. This episode is one such example of why his snub was a miscarriage of justice – just take a look at how he delivers THAT speech! “Sit down and talk” is his Akhaten, Stonehenge, Indomitable, Turn of the Earth, Absolute power, Do I have the right. It’s amazing and relevant to boot. Peter Capaldi goes through moments of being quiet to loud, subtle to dominating, slow to fast. The passion leaps off the screen and makes you feel as though he’s addressing you personally. It probes into deep-routed prejudices of society that you maybe didn’t even notice. In a world where the extreme branches of Islam are ever on the move and the majority of Muslims, people who aren’t terrorists, find themselves on the receiving end of vile and disgusting hatred. In a world where immigrants trying to escape said terrorists are victims of racial abuse, speeches like this one about favouring respect over prejudice and peace over war have never been more relevant. Doctor Who is not just for kids but I hope they paid attention and learnt something here. That is what makes The Zygon Inversion so much more than just an exciting and tense adventure and elevates it into all-time classic status. Doctor Who is a sci-fi show but that doesn’t mean it can’t speak into the real world like this episode does. I could talk some more about how awesome that speech was but I think (Bad pun alert!) it speaks for itself (I’m not sorry). I could copy out the whole thing but instead I’ve picked a few of the selected highlights. If that’s not a well-written piece of television then I don’t know what is! 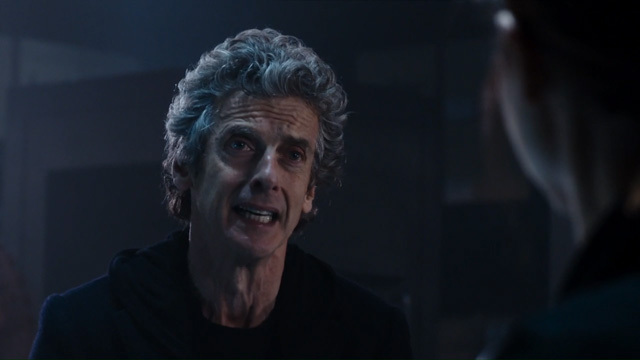 This speech will surely top the inevitable Best Twelfth Doctor Moments lists that we should expect when Peter Capaldi breaks my heart(s) by regenerating – it’s THAT good. 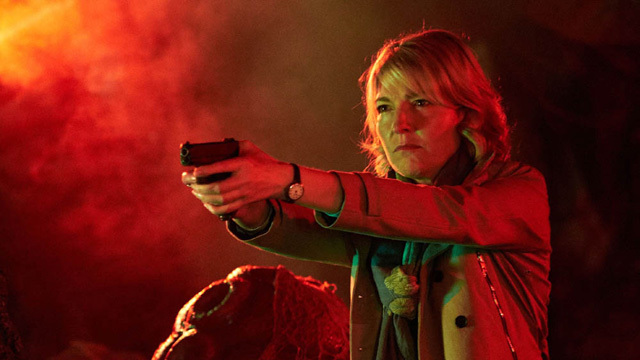 Peter Harness had to deliver a sequel to both Terror of the Zygons and The Day of the Doctor and, with Steven Moffat, he delivered something better than either. That’s impressive and had redeemed him in my eyes of Kill the Moon completely. This story is definitely a deserving fixture in my all-time top ten and should be in yours as well. Watch it again today. *That’s an actual scene from The Daleks’ Master Plan in case you don’t know.